Dua a 11 year male Samatran Tiger and Dora a 4 year old female Samatran Tiger cool down in the water at Drayton Manor Theme Park, Fazeley near Tamworth as the UK weather hits its hottest day of the year. Drayton Manor Zoo, part of the award-winning Drayton Manor Park, near Tamworth, Staffordshire, is the ideal place to explore and learn about the animal kingdom. Whether you’re crazy about big cats, mad about monkeys or barmy for birds, the 15-acre zoo has a wide collection of creatures great and small including a pair of critically endangered Sumatran tigers, bouncing Red Kangaroos, unusual Axolotls, fascinating reptiles and a mischievous Meerkat mob! Drayton Manor is an open plan attraction, so visitors don’t have to pay an additional fee for entry into the zoo, and it’s a great place to take a break from all the thrills that the theme park has to offer. Last season saw the arrival of the new Tamarin Trail, which takes adventurers through beautiful planted gardens, allowing them to come face to face with a troop of mischievous monkeys. 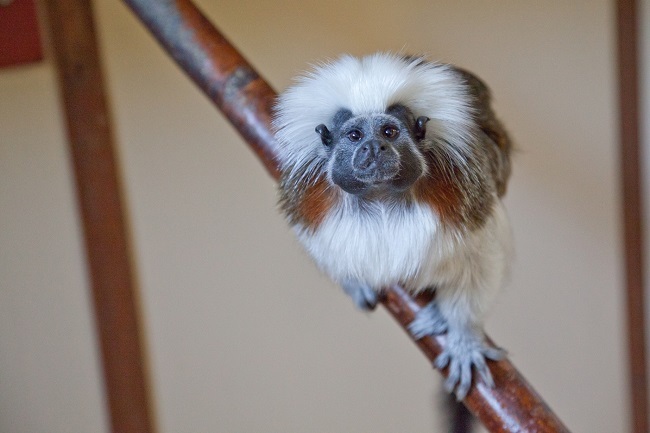 During the trail adventure, guests get up close and personal with the cute and inquisitive Tamarins and Marmosets, including the White Lipped Tamarin, Red Handed Tamarin, Emperor Tamarin, Cotton Top Tamarin and the Common Marmoset, which are housed across eight different enclosures. The zoo is a proud member of an international breeding programme and a member of the European Association of Zoos and Aquaria, which ensures it maintains the highest standards of care and promotes good breeding practices. The 15-acre attraction is also involved in conservation projects worldwide, and supports charities such as the World Parrot Trust, World Owl Trust and 21st Century Tiger.